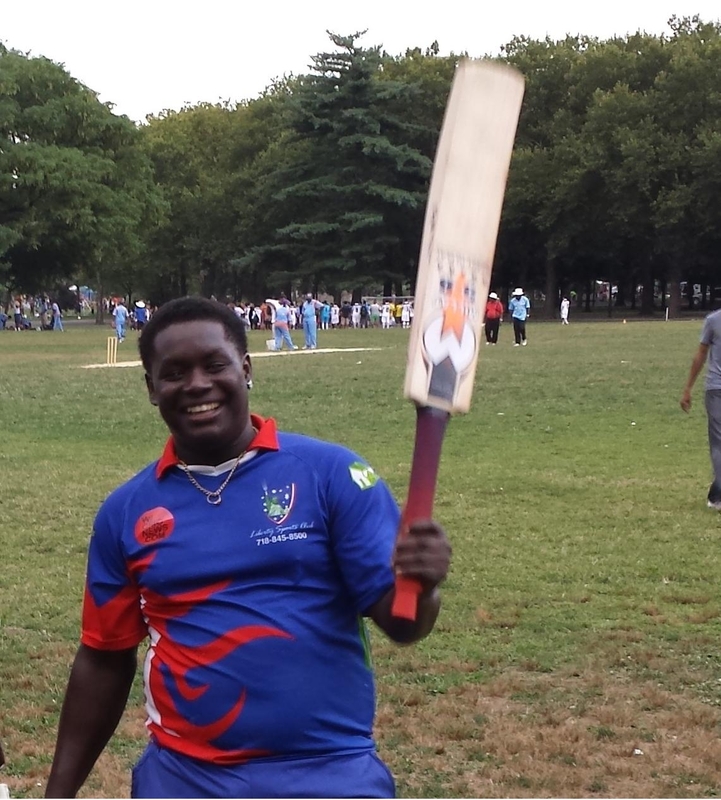 An inspired spell of new ball bowling between Trinson Carmicheal and Imtiaz Hassan routed New York Centurion Cricket Club for a paltry 54 when they met Liberty Sports Club (LSC) at Flushing Park on Sunday. Carmicheal bowled with fiery pace and hostility to scalp 6 for 29 off 7 overs while Hassan’s guile and accuracy was on premium display to knock over 4 for 15 in 8 overs. The duo build on a Terrence Madramootoo’s blitzkrieg earlier when LSC batted first. The big hitting right-hander hammered Six (6) sixes (6’s) and a four in his inning of 67 to help LSC post 194. The host captain, Danesh Deonarain, won the toss on the first summer Sunday in 2014 and chose to bat. Openers Dilly Khilawan and Altaaf Habibulla went about their task in very workmen like fashion, accumulating runs and picking off the odd boundaries on the heavy Flushing outfield. Habibulla was the first to go, run out, for 28 having made an injudicious call for a single. Khilawan would follow shortly after being trapped leg before. Carmicheal once again got a start before he was adjudged leg before wicket for 14. Madramootoo joined Deonarain in the middle and right away he signaled his presence with a powerful six over wide long on. The pair would add 25 before Deonarain miscued a pull shot and was out for 20 off a sharp catch by Trevor Singh. Hassan’s stay at the crease was brief but the fall of wickets did not bother Madramootoo. He went on to hit 25 off an over while he and Bose Persaud put on 42 for the 6thwicket. Another massive six brought up Madramootoo’s half century as he had celebrated his birthday the day before. The power hitter only needed 11 overs to get to his 67 and would have possibly scored even faster had he found a reliable partner to stay with him. The remaining LSC batsmen moved the score along to 194 after Madramootoo was out with 183 on the board. Carlos Bachu was the pick of the NY Centurion bowlers with 2 for 21 off 6 overs while Shamar Graham and Carlton baker picked up two (2) wickets each. Centurion’s attempt at a chase lacked any resilience baring Graham and Bachu who both managed to get to double figures. Six batsmen returned to the pavilion failing to get off the mark and that included numbers two (2) through five (5). Hassan trapped Trevor Singh on the crease for 8 to start the crumble, then had the number (3) batsman nicking to the wicket keeper, Bose Persaud. The double strike by Hassan inspired Carmicheal to his own double strike the very next over. Nicholas Harripersaud managed an edge to the keeper and Steve Ragubar lost his leg stump the next ball. The hat-trick ball saw a loud LBW appeal turned down before a maiden was completed. Hassan sent down a maiden immediately after then wicket numbers 5 and 6 would fall to leave the chase in tatters at 6 wickets for 9 runs in the 7th over. Bachu counterattacked, making room and heaving at the pace of Carmicheal. He would get through with 14 runs before the paceman uprooted his middle stump to celebrate his five wicket haul. Graham played sensibly for his unbeaten 16 but the remaining batsmen were wrapped up in the 15th over to seal a massive 140 runs victory. The win moves Liberty SC to 5-0 in the Eastern American Cricket Association Power40 competition. #TheBlueNation takes on the formidable Everest/ACS next Sunday at Lido Beach and will be looking to make it 6-0. This entry was posted in Eastern American Cricket Association, Flushing Meadow Park, Lido Beach, News and tagged Eastern American Cricket Association Power40, Imtiaz Hasan, Liberty SC, NY Centurions, Terrence Madramootoo, Trinson Carmichael. Bookmark the permalink.